Most of the scientists who work closely with chimpanzees in their research are also sensitive to the species’ endangered status. A number of factors contribute to chimps’ precarious position in their native Africa: habitat loss, the bushmeat trade, and the pet trade. 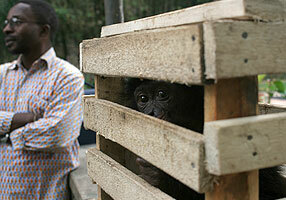 And some chimp experts also have concerns about how media portrayals here could affect chimpanzee survival abroad. Read on to learn about The Human Spark’s interaction with evolutionary anthropologist Brian Hare and why he says it’s problematic to have chimps in the pet and entertainment industries. Part of my job as Associate Producer for The Human Spark is getting each person who appears on camera to sign our release form, which gives us permission to use what we film with them. To be honest, it’s usually the easiest part of my job! 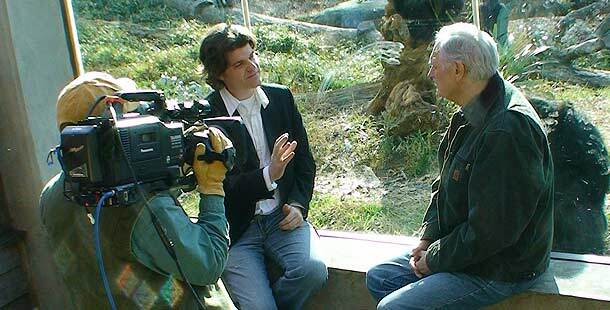 But when we filmed with Duke University’s Brian Hare at the North Carolina Zoo, he resisted. Brian wanted to wait to grant his permission to air the footage we shot with him until we could guarantee that we’d used no “Hollywood” chimpanzees in our show. He’d recently had a bad experience with another film crew that did include Hollywood chimps in their program about human cognition, and he was adamant that he wouldn’t sign until he could know for sure that The Human Spark had not done the same. So our crew left North Carolina with footage of a fantastic exchange between Brian Hare and Alan Alda – but with the release form unsigned. At the time, it just seemed like a speed bump, not a brick wall. The Human Spark had no intention of turning to stunt trainers to get footage – our interest is in the behavioral studies that respected scientists do with chimps, not tricks they can be trained to perform. We continued on our travels around the world, filming as we went. A still from the opening scene of So Human, So Chimp with Alan and Noah the young chimp and Russell the little boy. One of our most important scenes was the open of the second program, So Human, So Chimp. Each Human Spark episode begins with Alan Alda setting up the hour’s theme by speaking directly to camera. In this case, the theme is that chimps and human beings share a lot of characteristics, but are also 6 million years of evolution apart. After hearing about a docile, home-raised chimp from another one of our experts, Series Producer Graham Chedd had an idea; he decided the most effective way to get this theme across was to have Alan introduce it while sitting with a young chimp and a young child. Filming with Noah, this young pet chimp who was well-accustomed to being around people, seemed like the safest and most responsible way to create this kind of compelling scene. Cut forward several months. We needed to get that appearance release signed by Brian once and for all in order to broadcast the footage of him. But through email exchanges, it quickly became apparent we hadn’t fully understood Brian’s objections. He was OK with the material we had shot at zoos, sanctuaries and research centers because they are regulated by tough animal welfare standards. But featuring ANY privately owned chimp in the program would be enough for him to refuse to participate. And so we came to an impasse. Infant chimpanzees are shot off their mothers' backs in their African habitat and sold internationally – a trade that is threatening chimpanzees with extinction. Brian patiently explained his ethical objections to us. He believes that filming pet or entertainer chimps helps contribute to the illegal international trade in infant chimpanzees – a trade that is helping push this endangered species closer to extinction. 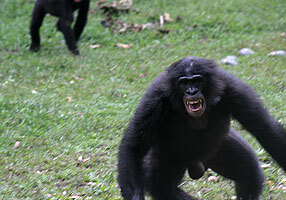 Brian worried viewers would get the mistaken impression that chimps make good pets; in fact, once they mature into strong and unmanageable adult chimps, virtually all of these animals are given up by their owners. Brian says some are even killed. There’s simply not enough space or resources to rehabilitate the hundreds of pet chimpanzees that are kept across the United States. Brian is troubled by the overall effect on the chimp species in the wild as well as by the suffering endured by individual privately owned chimps. Others agree, and in fact, major scientific, welfare and health organizations have policies against using privately owned primates in films. Brian’s arguments were thoughtful and reasonable to The Human Spark team though he did concede that there is little scientific evidence that links TV portrayals of animals to the illegal pet trade. His group is currently conducting research into just this question so in future the debate can be informed by empirical evidence in addition to compassion for our primate relatives. On the other hand, Graham pointed out how important the opening scene was to the film. Alan’s narration clearly included the facts that the differences between the child and the chimp would increase as they each grow up, and that the native habitats of chimps and their continued survival in the wild is in jeopardy. Graham also explained that the shot that follows this introduction is of Hondo, a full-grown alpha male at the North Carolina Zoo, lunging at his glass enclosure and scaring Alan. Graham felt the contrast between the cute baby chimp reaching up to Alan and the aggressive adult chimp trying to hit him, would powerfully transmit the idea that keeping chimps as pets is a very bad idea. He also added a line of narration that explains how Hondo was captured illegally in Africa as an infant, and shipped to the United States as a pet before he was rescued and eventually brought to the zoo. We needed to come up with a compromise. Since all of us involved in this debate are in possession of our own human sparks, we called upon our sociability and ability to work together to move toward a solution. First, Graham made sure that Alan’s narration clearly explains the threats to chimpanzee survival posed by the bushmeat business and the illegal international trade in baby chimps. Graham also took out a portion of the opening scene where the baby chimp climbed up unbidden to hug Alan – it was undeniably cute, but in light of the points Brian had raised, Graham agreed that it might give the wrong impression. Then The Human Spark production team arranged for Brian to take part in an ethics panel at a major nature film festival. Panelists discussed the use and abuse of animals in documentary films, and Brian was able to educate a vast group of filmmakers about the dangers of filming with privately-owned chimps. He even had a pamphlet [.RTF] ready for festival participants. So, as a result of our experience on The Human Spark, filmmakers are now better informed about the controversy surrounding the use of Hollywood chimps, and more aware of the possibility of unintended consequences. Finally, we all eagerly agreed to post an explanation of this issue on the Human Spark website. By exploring the controversy and explaining our case study, we hope to get our viewers thinking about the issues as well, something that wouldn’t have happened if we had simply cut the problematic scene and moved on. 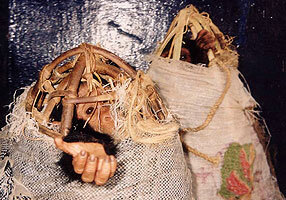 Read an article Brian Hare wrote for The Human Spark about why chimpanzees are not pets.